We hired a local company to put up a fence for us a few weeks ago. We’d talked about it for awhile, mostly in terms of safety and keeping you hemmed in a bit, but we knew it would have to be a pretty long fence and we couldn’t decide how to partition off the yard. Houses in our 1950s neighborhood are pretty close together–though not nearly as close as those of most of my suburbia friends. Still, on one side, we’ve got a double driveway separating us from our neighbors. Or “joining us intimately to our neighbors” is perhaps a better way to put it, given the impossibility of keeping our lives separate from theirs, even if we wanted to. So there’s no place for a fence on that side. On the other side, well, we’ve got an extra lot. It’s all wonderful green grassy yard, except the part we’ve dug up to plant a garden and the old, precariously still-standing trees. On that extra lot is a decades-old swing set, the pine-tree-green painted metal kind I played on as a kid. Perhaps because it is such a retro swing set, or because that extra lot is also on the corner of our block, the neighbor kids like to swing on it. We’ve welcomed and encouraged them to play in our yard for the five years we’ve lived in this house, but it’s really only been this summer that they’ve finally started doing so. It helped that it got so hot back on mother’s day weekend that we got out the impressive kiddie pool and acquired a sandbox. But even during the preceding weeks, that ancient swing set became the highlight of the neighborhood, it seemed. The more the yard got used by you and by the neighbors, the more we really wanted a fence. A picket fence. Four feet tall. Spaces between each slat. It wasn’t to block everyone out, just to keep them safer. So we had a local fencing company come and give us an estimate, and then finally, after many weeks of rain, they arrived to build the fence. We knew they would do it in two days–the first day, placing all the big brace posts, and the second day, putting up all the pickets. It would seem miraculous. Except that the posts they sunk into the ground the first day were all eight-footers. Eight-foot posts, every few feet, all the way around the immense side yard. It looked like we were building a fortress. The truth is, I kind of judge people who have privacy fences, at least the kind of privacy fences that are keeping their yards private from the road. 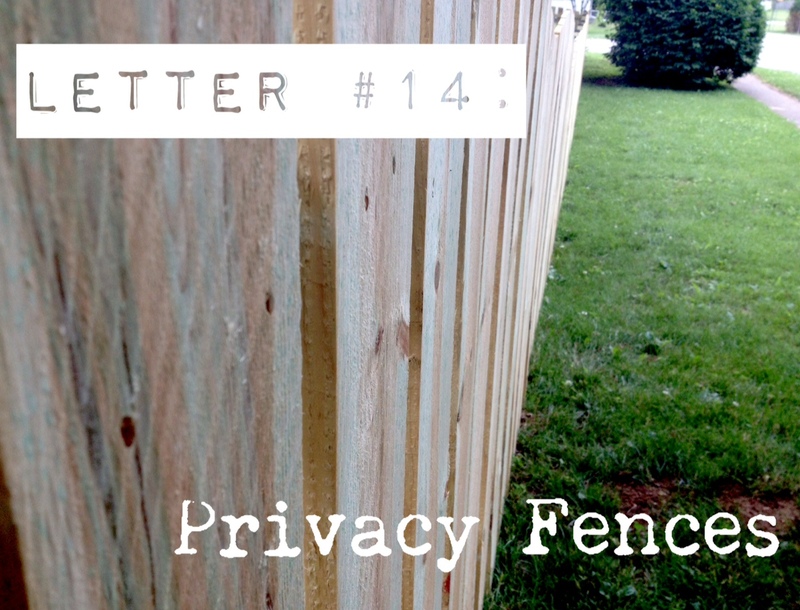 Sure, I understand putting up a tall fence along property lines–that’s what we did along the back, given the plethora of sheds and outbuildings and a leaky swimming pool our neighbors to the rear have–but, well, privacy fences are just so unwelcoming. And that is ridiculous, I realize. Nobody cares what kind of fence you put in your yard. At least, most people don’t. I tried to reassure myself. So apparently I’m not the only one who has a category of “privacy fence people” in their minds. The good news: We don’t seem like those kind of people. The bad news: Our posts made us look like those kind of people. It didn’t matter in the long run, of course. Within two days, we had the fence built and trimmed down to size. But it did get me thinking about what “kind of people” we are and how we present ourselves to our neighborhood. We’re community folks. We’re hospitality folks. We’re it’s-okay-to-invite-friends-in-for-dinner folks. But do our neighbors know that? I can say that I want our yard to be a welcoming place for the neighbor kids, but I don’t know the names of our older neighbors directly across the street from us. It’s awkward, five years in, but we’ve remained in that wave-from-a-distance kind of relationship. Trying to remedy this, I did walk their little dog back over to their house the other day when she showed up in our yard, and as a result I learned the dog’s name is Daisy. The dog’s name. It’s a start, I guess. I’m glad that people who know us know that we aren’t privacy fence people. But what kind of people are we? Well, I suppose that’s always a good question to ask yourself.